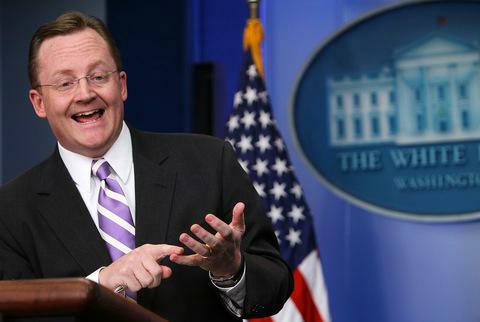 Robert Gibbs, President Barack Obama's former press secretary, says that he was once instructed by the White House not to acknowledge the administration's use of drones. "When I went through the process of becoming press secretary, one of the first things they told me was, you're not even to acknowledge the drone program," Gibbs said on MSNBC's "Up With Chris Hayes" on Sunday. "You're not even to discuss that it exists." Or, to paraphrase an oft-quoted line from David Fincher's 1999 film "Fight Club": The first rule of the drone program is you do not talk about the drone program. Gibbs, who was recently hired by MSNBC as a contributor, called the proposition "inherently crazy." "You're being asked a question based on reporting of a program that exists," Gibbs, who served as White House press secretary from 2009 to 2011, said. "So you're the official government spokesperson acting as if the entire program—pay no attention to the man behind the curtain." Obama's former spokesman said that while the administration has recently expressed the need to be more transparent about its use of drones, certain aspects of that program are "highly sensitive" and will likely remain secret.